Laying Floor Fitted Linoleum is so easy . ed ... instructions, paste, spreader, chalk, chalk line. figuring to do, no major cutting, no waste. lar waxing keeps it that way. 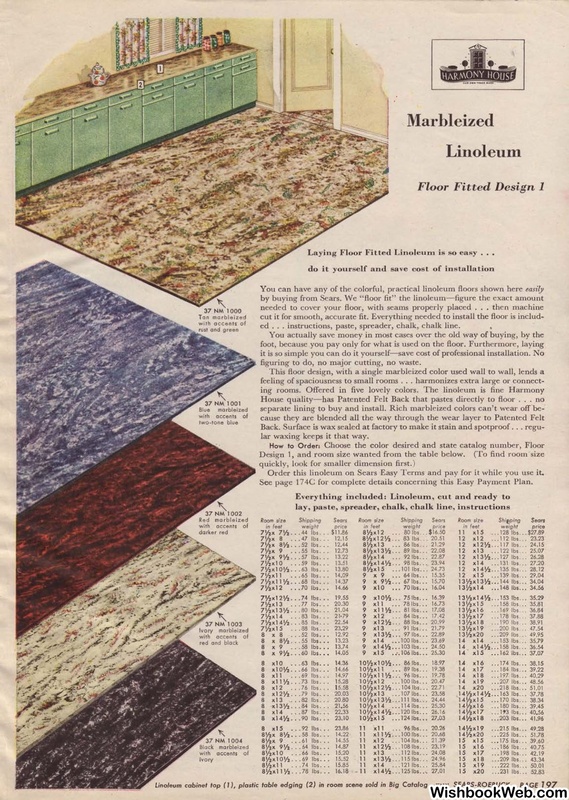 Order this linoleum on Sears Easy Terms and pay for it while you use it. See page 174C for complete details concerning this Easy Payment Plan. 7Y2x 8 ... 47 lbs. 7Y2x 9y,. .. 52 lbs. 7'hxl 2y,. .. 74 lbs .. .
7Y2x14 ... 83 lbs .. .
7Y2xl4Y>- .. 85 lbs .. .
xll ... 69 lbs. ..
x11Y>- .. 73 lbs .. .
xl2 ... 76 lbs . . .
x12Y,. . .79 lbs . . .
xl4 . .. 87 lbs .. .
xl 4y,_ .. 90 lbs .. .
8 x15 ... 92 lbs .. .
58 lbs . . .
8Y2x 9 ... 61 lbs .. .
8Y2xlO ... 66 lbs .. .
8Y2x10Y,. .. 69 lbs .. .
8Y2xll ... 741bs .. .
8Y2xl lY2 .. .78 lbs .. .
11 xl 3 ... 112 lbs.